Ker-Sangri-Kumat is one of the extraordinary dishes in Marwari/Rajasthani cuisine. Named after desert berries and fruits, this item is prepared in a myriad of ways across the drier expanses of Rajasthan, the royal state of India. The story goes that long time back during extended dry periods, the local people look to these produce of the desert and cooked up dishes that needed little water and stayed well for long. 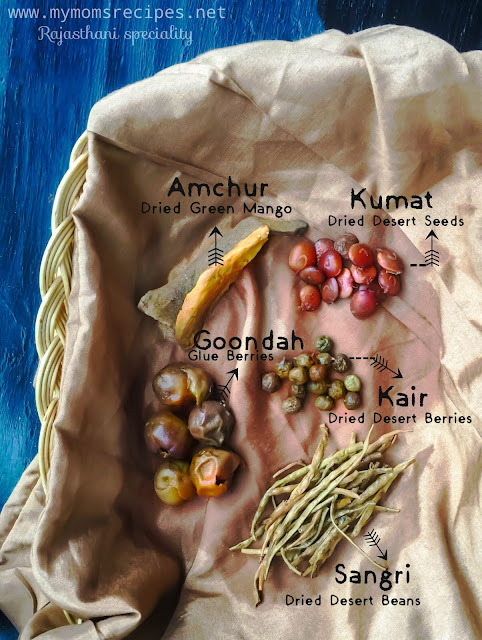 The basic ingredients are KER, a red fleshy berry, SANGRI, a slender bean, and KUMAT, a small disc-shaped herb, all of which flourish in the arid Thar weather. The most common styles of preparing these are pickling and stir-fry. 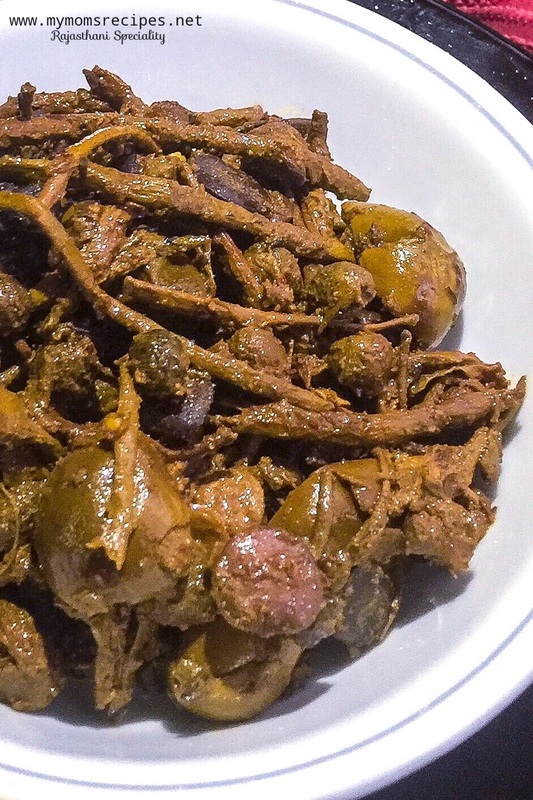 The pickle is prepared using the sun-dried Ker-Sangri and Kumat, with generous amount of oil and spices, and it preserves well for long periods. The stir-fry method is more elaborate. Its call Panchkuta, meaning there needs to 5 base ingredients to start with. So, apart from Ker-Sangri-Kumat, enter 2 new other ingredients - Goondah, which is another wild berry and Amchur, which is dry mango powder. The sabzi (stir-fry) made from these 5 items, with help from generous amounts of aromatic Indian spices, is very delectable. 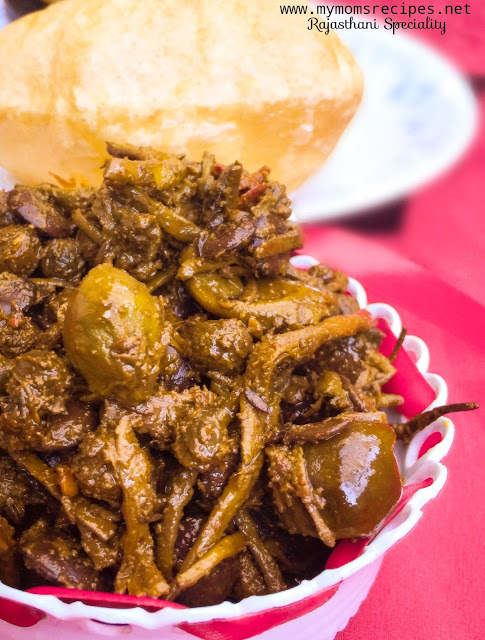 If you like rustic Indian food, the peculiar earthy taste of Panchkuta makes your direct connection with the desert soil in every bite. Gone are the days when Ker-Sangri or Panchkuta was only limited to villagers or camel riders of the desert areas. These are in vogue now and sit proudly in the regional section of many hi-end restaurants and a must even on royal wedding menu. I personally love the chef's preparation at Vivanta By Taj-Hari Mahal, Latitude restaurant in my hometown Jodhpur. You can find this divine preparation under the regional specialities by the name Ker kishmish makhana. However, with the mainstreaming of these wild berris and the innovations on this basic rustic cuisine, it has acquired a higher pedigree of late and the casualty of that has been price of the raw ingredients in the local markets of Rajasthan, as it has gone up significantly. But that will hardly be a hindrance for the connoisseur of the rare and ethnic food. There are so many different ways of preparing this Thar cuisine, but as always, I adopt the cooking method from my Mom's kitchen. 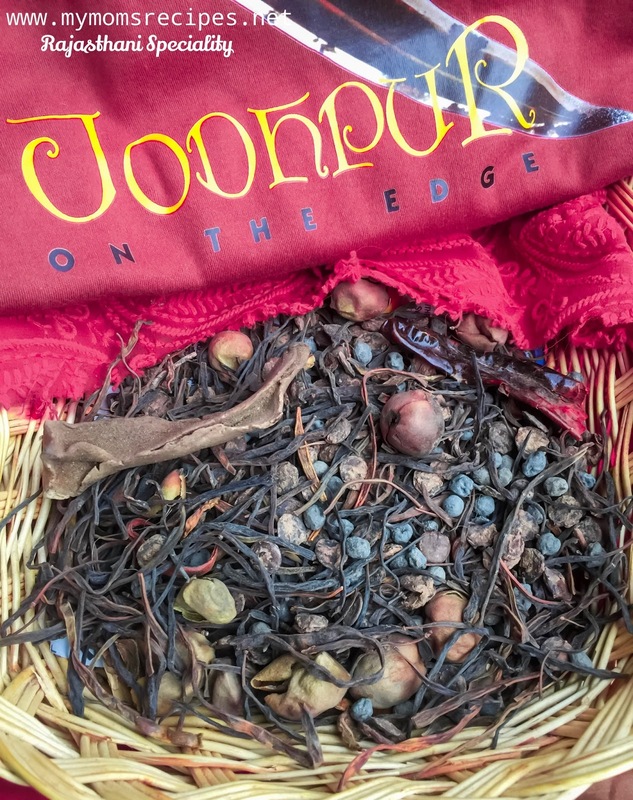 The simple traditional way of combining these wild berries with aromatic spices and a process of slow cooking. Soak KAIR-SANGRI in water overnight. Separate the raw mango slices from the panchkuta. My mom says, any type of amchur should not be cooked over hight heat for a longer time duration. Add cumin seeds, mustard seeds, asafoetida and dry red chilis. Sauté for a minute on medium flame. Add Green Chilis and the colander dried panchkuta. Sauté on medium-high flame for 4-5 minutes with continuous stirring. Lower the flame, add turmeric powder and half a teaspoon salt. Cook for another 10 minutes on medium heat without cover. Keep stirring occasionally. As you see the beans have started softening a little, which they will after 10-15 minutes, add the red chili powder, Kashmiri chili powder and coriander powder. Mix everything well over medium flame for about 2-3 minutes. Add the remaining salt and boiled water. After opening the lid, add the raw mango powder and the raw mango slices. Mix well. Cover and cook on low heat for 10 more minutes. Remove from heat. Add garam masala powder. Cover and let it sit for 20 minutes. No heat required. Traditionally, the dish is of dry consistency, but you can adjust the final consistency according to your taste, by adding more water or yogurt. 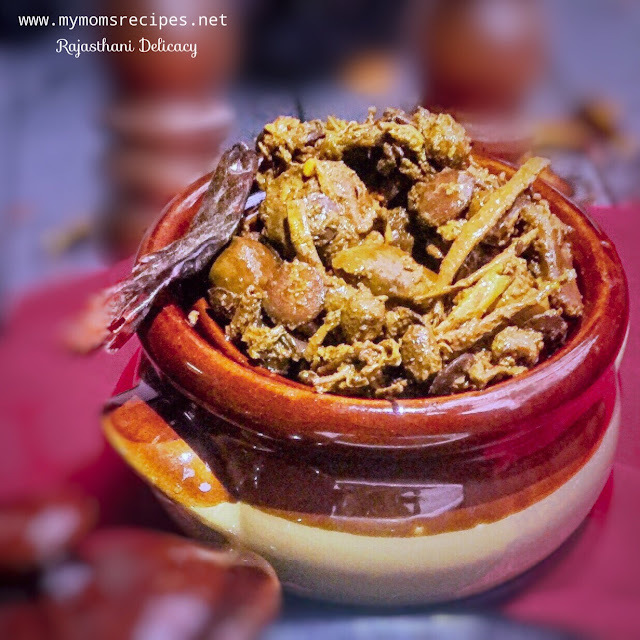 Serve with Poori or Bajri (Millet) Roti.